Have you experienced Outdoor Travel? Help others learn about this company by sharing your first-hand information with other road-trippers. A well-liked RV business in Canada, Outdoor Travel carries a fleet of motorhomes, along with travel trailers and fifth wheels, mostly at decent prices. Established in 1992, Outdoor Travel RV still rolls to be one of Canada’s top RV dealers, with an extensive showroom filled with hundreds of RVs. Located in Hamilton, Ontario, the company caters customers year round and takes pride in their great service across all departments. The rental section offers competitive rates, which can be fully taken advantage of if you rent a unit for up to one year from your scheduled return date. You will save 1-week rental or $1, 500 (whichever is less!) Not only that, you’ll get another deal of savings as they allow free parking of your personal vehicle at their premises. Outdoor Travel bears different RVs in various sizes and models. 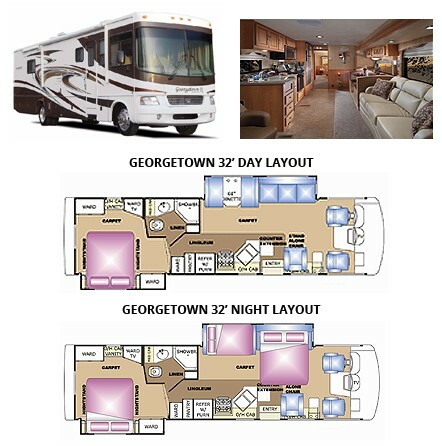 Brands include Georgetown, Sunseeker, and FR3 for motorhomes, and Viking for trailers. Featuring only Class A and Class C models for the motorhomes, these units are recommended for small families to big groups. You may bring your own bedding and kitchen/ dining stuff or rent out kits from them, together with bike racks, lawn chairs, and GPS. 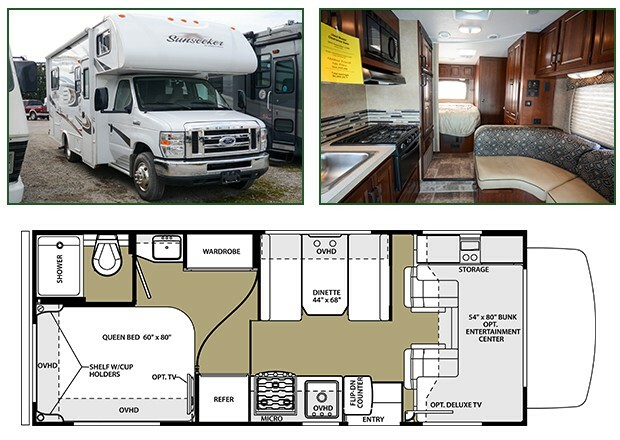 As the smallest option on the fleet, this Class C motorhome still attracts bigger group up to 5 people. Also, couples or even small families will appreciate this motorhome because the cabover area can be converted into an entertainment center. The rear bed area comes has a shelf with cup holders, overhead cabinets, and an optional TV. 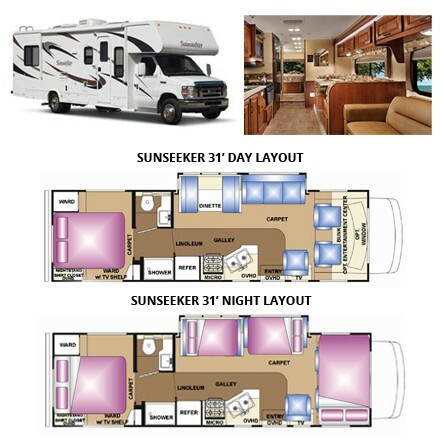 A bigger Class C, the 31’ motorhome now has a slide-out for a larger interior space. Sleeping up to 8 people, the living area is carpeted while the kitchen galley is well-furnished. Also, you can either utilize the cabover area as a bunk bed or entertainment center, both with optional window. The bathroom with separate shower and toilet is positioned before the private rear bedroom. 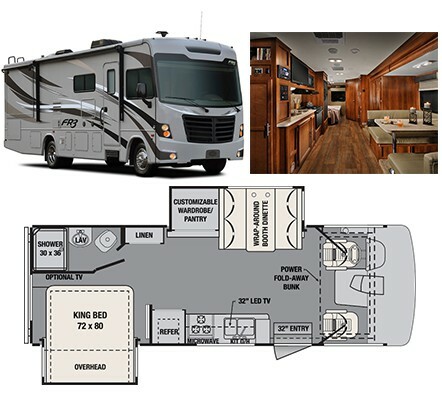 A double slide motorhome, the 32’ Class A RV is way too spacious for a family of 6. Sleeping options include the dinette bed, sofa with pullout bed, and rear queen bed. There’s a nice alcove chair at the back of the front seat. Both the living area and bedroom are carpeted for added elegance. 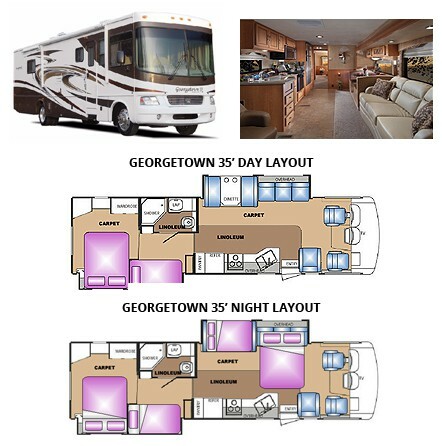 Another Georgetown model is this 35’ Class A with bunks. A 7 berth motorhome, the unit also has two slides. There’s a small table between the front seats and a small chair at the back for in between talks. The sofa provides a single, pull-out bed. The L-shaped kitchen features a linoleum flooring, and some great facilities including refrigerator, gas stove, sink, cabinets, and more. As to the insurance coverage and reduction options, you need to verify with the company upon request for quotation. 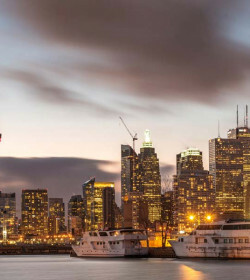 As a whole, Outdoor Travel is one of the most trusted RV companies in Canada, with high demand for sales and services. Their rental department is a good choice, only if you’re looking for a fleet of Class A and C motorhomes. These units are mostly big, making it not that attractive for couples wanting a small, simple road trip. Still, these motorhomes are great quality models that provide great space. With a good reputation and quality service from other departments, it’s not hard to fall in love with Outdoor Travel rental options that are priced satisfactorily. Have you experienced Outdoor Travel?